America has done scant justice on the pages of history to the first citizens of this country, the North American Indian. It is a matter of regret and a loss to posterity that we possess, comparatively so little written matter of the life and traditions of the Five Civilized Tribes, whose achievements made possible the earliest history of Oklahoma. Research students know that the history of the country, embraced within the boundaries of this state, began with its Indian civilization long before the run of 1889, or the later advent of statehood, relating in fact, to the old tribal nations in the different states from which they came to re-establish their governments in the now Indian Territory. From the background and fertile soil of this civilization, blossomed in all its magic growth and progress, the young star, Oklahoma. General Stand Watie was one of the most influential characters in the early history of Oklahoma. Some of the salient points in his eventful career will, no doubt, be of interest to readers of the Chronicles. He was a North American Indian, one of the noblest sons of the Five Civilized Tribes. His courage and military prowess were known far beyond the limits of his activities, and his loyal service and constructive influence were a potent force in the history of his people. He was born at the Watie home on the Coo-see-wa-tee stream in the old Cherokee Nation in Georgia, near the present site of the city of Rome, December 12, 1806. His kinsmen were among the prominent leaders of his people, his father David Oowatie, being the younger brother of Major Ridge, a well known chief and orator of the Cherokees. His mother, Susannah, a descendant of Charles Reese of North Carolina, was one-half Cherokee and like her husband spoke the Indian language altogether. She was a member of the Moravian Church, the first to establish missions among the Cherokees. His father, a quiet, retiring man took no active part in National affairs, either in the old or new country. General Stand Watie was one of eight children, three daughters and five sons, two of whom rose to places of eminence in their tribe. In those days a Cherokee child was usually given an Indian name with some special meaning and sometimes an English name as well. Often these personal names, or their English interpretation, were taken as surnames which accounts for the difference in the family names of own brothers, as in the case of Watie, Ridge, and Boudinot, though this last was an adopted name as is explained later in this sketch. The given name of General Watie is especially significant. At his birth he was called "Takertawker," meaning "To stand firm; immovable." Surely an appropriate name for one so steadfast in character and so ready to support his convictions of right at any cost. Watie spoke only his native tongue until twelve years of age, when his parents sent him to the little Moravian school at Spring Place where he simplified the spelling of Oowatie, dropping the "Oo"; and though his mother had named him "Isaac" also, he retained the English meaning of his Cherokee name, "Stand," and ever afterward wrote his name simply "Stand Watie." The family name from that date was always spelled "Watie," often mis-spelled "Waite." His brother Elias, and his cousin John Ridge, were sent East to school, but Watie's education was limited to the meager advantages of his own nation. This is proof of the fiber of his intellect and ability, for he attained a distinguished place as soldier, statesman, and leader despite this educational handicap. He was never an orator, even in his native tongue, but wrote with ease, as is characteristic of the Indian. General Watie was a man of action and few words. No one ever rose to a place of such importance who had less to say. He was not a handsome man as was his brother, Elias, but his features gave evidence of the strength of his character and courage. His friendships were slowly made but loyally retained. His sympathies were easily touched. Little children loved him and the needy were glad to call him friend. To better understand this remarkable man who was so intimately associated with the Cherokees during the most turbulent period of their history, both in the old nation and the new, it is necessary to touch briefly upon some of the contemporary events which so profoundly affected his life. At the time of Watie's early manhood, the Cherokees, due to certain factors, had reached a high state of culture and civilization among the North American Indians. Missions were more common among them; many of their young men had been sent away to school, often to Eastern colleges, and returned to lend more progressive ideas. Sequoyah had invented the Cherokee alphabet. At New Echota, Georgia, their national capital, the first newspaper ever printed in both English and an Indian language had been established, with Elias Boudinot, Stand Watie's elder brother, as first editor. This brother earlier known as "Buck Watie," a name originating from his Cherokee name which meant "Male Deer," had been educated by a well known philanthropist, Dr. Elias Boudinot, of Princeton, New Jersey, with the request the boy should take his name. This Buck Watie did and when his education was completed he returned to his own country, where he was destined to play so influential and tragic a part. His descendants, some of whom still reside in Oklahoma, retained the name of Boudinot. Watie was thirty one years old when he emigrated with family and kindred to the new Territory, now Oklahoma. Though he was clerk of the Cherokee National Supreme Court in 1829, he had taken little part in politics. The more active and eventful years of his life followed the emigration. The final result, emigration, was inevitable from the first, and history has proved the wisdom and foresight of those who advocated removal at the price of their personal safety. Unfortunately, the enmity and lust for power occasioned by the controversy, was carried from the old nation into the new by the Ross party, and this finally culminated in the tragic assassination in one night of Major Ridge, John Ridge, and Elias Boudinot, three of the most powerful men in the nation. Stand Watie was slated to die the same night, but was away from home and so escaped. Responsibilities seem to gravitate to the shoulders that will carry them. Although burdened and saddened by the fearful murder of his uncle, cousin, and beloved brother, Stand Watie now became the acknowledged leader of the Ridge or Treaty party. This tragic event proved a turning point in the career of Watie, one that thrust him from the home life he loved into a position of activity and prominence in the political affairs of his people. Unshaken by feuds and factions, which constantly threatened his life, from that time on his power, purpose, and courage proved of lasting influence. The internal difficulties of the Cherokees were finally settled by the Treaty of 1846; and Watie as a leader of his party played a prominent part in bringing about this treaty, which ushered in a brief era of peace and prosperity for the Cherokees. He was speaker of the Council from 1857 to 1859, and a member of the Council from 1846 to 1861. Stand Watie was married in the new Nation, September 18, 1842 to Sarah Bell. The two families were friends of long standing, and his wife's brothers, Colonel Jim Bell and Jack Bell, were schoolmates of Watie. Of this union there were three sons, Saladin, Solon, and Cumiska, and two daughters, Minnee and Jacqueline. His home life was congenial and very happy, darkened only by the unfortunate political conditions of his time, and the separations and suffering occasioned later by the War of 1861. In the years that intervened, from the Treaty of 1846 until the outbreak of the war, Watie had some time to devote to his personal interests and fortune. He accumulated some valuable properties, and built a number of substantial homes. During this interval he lived quietly, enjoying the love and esteem of his neighbors and friends. This era of peace, all too brief, was broken by the shadow of suffering and division into which the war plunged the entire nation. In the conflict that followed Stand Watie naturally assumed the place of leadership, for which he was so well qualified. A Southerner by birth and breeding, he unhesitatingly cast his lot with the Confederacy. The military career of General Watie comprises the whole of the Confederate History of the Indian Territory. Many people have believed, erroneously, that little war activity took place in the Indian Territory, and that that little was in the nature of guerilla warfare. Nothing could be further from the truth. Long before the Treaty of 1861, made with General Pike as Indian Commissioner of the Confederacy, large numbers of the Cherokees and whites had offered their lives to the cause of the Confederacy, and pledged to follow where Watie led. So at the very outbreak of the war, Stand Watie had organized, and been made Captain of a troop of Cherokees and whites, for the purpose of protecting the Indian Territory, especially the Cherokee Border, from the Federal forces stationed at Humboldt, Kansas. Between this point and the Cherokee Nation were the Osage Indians, who were nearly all Unionists, and ancient enemies of the Cherokees. There is no doubt that the wisdom and timely action of Watie and his men saved his people during these early days from even greater hardships than those they later experienced. In May, 1861, Watie offered his services to General McCulloch of Texas, who had been given the command over the military district of the Indian Territory. His offer was gladly accepted. He was given a Colonel's commission and authorized to raise an Indian regiment, which was known as "The Cherokee Mounted Rifles." Watie received high commendation from General McCulloch, and was ever in harmony with his superior officers, and acting under regular army orders. At the beginning of the war, John Ross, as principal chief, had signed the Treaty of Alliance with the Confederacy, but afterwards renewed his policy of friendship with the Federal government and went to Washington where he remained until the close of the conflict, the Cherokee Nation being left at this crucial period without an official head. In 1862 a National Convention of the Cherokees was held, at which time John Ross was deposed from office of principal chief, and Stand Watie elected to succeed him. Federal members of the Council, said to have constituted a quorum, refused to recognize this election; but from that time on the Cherokees had two tribal governments, and all official business of the United States Government with the Southern Cherokees at the close of the war, was conducted through Stand Watie as their head. Space does not permit details of any of the battles fought on Indian Territory soil—some eighteen or twenty in number, in which Stand Watie and his command did such heroic service. Some of these engagements were in important battles that took place on the borders of Arkansas and Missouri, but the larger number occurred in such familiar localities in Oklahoma as Fort Gibson, Webbers Falls, Bird Creek north of Tulsa, Muskogee and nearby points. His men declared that General Watie and his Indian Brigade marched over as many miles, had as many independent conflicts and skirmishes, captured as many trains of wagons, horses and mules as any one brigade west of the Mississippi. Stand Watie showed such efficiency as a leader and commander, that on May 10, 1864, he received from President Davis the appointment of Brigadier General in the Confederate Army, and later was brevetted. Except for Alexander McGillivray, who was commissioned as General in the United States Army in 1790, Stand Watie is said to be the only North American who ever attained this rank. He was the only Indian to receive this distinction in either the Union or Confederate Army. After this promotion, the Indian Territory troops were re-organized with General Watie as Commander-in-Chief, being known as General Watie's Indian Brigade, and included all Confederate Cherokees, as well as Creek and Seminole Troops, the Choctaws and Chickasaws being largely under the command of General Douglass Cooper, though they too were later attached to Watie's command. As many know, General Watie had the honor of making the last surrender of the war, which occurred at Doaksville, in the Choctaw Nation, June 23, 1865, nearly three months after the surrender of General Lee. When the dark shadow of Reconstruction days enveloped the South, no section was found to have suffered greater devastation than the Cherokee Nation, for that region, though small and remote, had been occupied by both armies. What had been a scene of prosperity and rapid progress in 1861 was now almost a destitute wilderness. The losses of the Union Indians were provided for by the United States Government, but the Southern Cherokees had not only the loss of property, but also of citizenship to reclaim. It was during these days that General Watie proved a savior as well as a leader of his people. Throughout the war he had taken upon himself the task of rescue and relief for helpless Confederate families, and now he took upon himself the gigantic burden of alleviating the distress of reconstruction, extending his personal help and financial aid to all he could. Internal discord, as well as the hardships resulting from the war again beset the Cherokees. The Northern branch confiscated the property of the Southern Cherokees, and denied them the right of suffrage. General Watie with many other prominent Cherokees was untiring in his efforts to bring about harmony and the restoration of the rights of the Southern branch. The controversy was finally settled by the Treaty of 1866 which procured re-instatement of the Southern Cherokees, but at a costly price to them. Many phases of this treaty were objectionable, but the most unjust clause was that which demanded of the Southern Cherokees an equal division of his lands and inheritances with his former slaves and their posterity, which was not required from any other Southern state. The war ended, his people reinstated as citizens, General Watie retired from the public life which Fate had thrust upon his home-loving nature. Impaired in health, and broken in fortune, he engaged for a time in the mercantile business in Webbers Falls, Oklahoma, later moving to his farm near Bernice, where he spent his remaining years. Sadness and suffering did not end with the close of the war for General Watie. His youngest son had died while a refugee in Texas, and in 1868, Saladin, his eldest son, was taken after a brief illness. Solon died just one year later. The loss of these sons, so full of promise, forms the saddest page in the life of this great man. His magnificent constitution had been weakened by the hardships of war, and these sorrows which followed so rapidly seemed to hasten the end which came to his own courageous spirit September 9, 1871, while on a visit to his old home on Honey Creek. 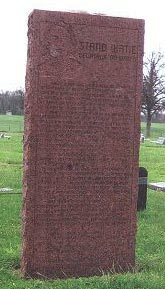 He was buried with Masonic honors not far from this home, in the old Ridge cemetery, Delaware County, Oklahoma. His daughters did not long survive him. His wife, who had been such a faithful companion to him, died in 1883. It has been the privilege and pleasure of the Southern women of Oklahoma, through their Division of the United Daughters of the Confederacy, to pay a long neglected tribute to the memory of Stand Watie by erecting a simple, yet dignified, monument at his grave, and a large and beautiful memorial on the Cherokee Capitol grounds at Tahlequah, where once his power and influence were so potently felt. A careful search of the official war records reveals nothing but praise and commendation for Watie. Some of the finest tributes paid him as a man and an officer came from the North, as well as from the men who served under him. In return for the justice and consideration he accorded his soldiers, they gave him a devotion that was touching in its loyalty, from the highest in rank down to Dutch Billy, the bugler and John, the Swedish cook. In this connection I am reminded of the many stories told me by "his boys" as they called themselves, and indeed, most of them were mere boys when they enlisted. Of how after long and wearisome marches, food being scarce, he would refuse some specially prepared dish, because his men could not share it. How often they had awakened at night to find him sitting by the fire, his blanket covering some soldier who needed it. He never ordered a charge that he did not lead, yet he never received a wound in battle. The full-bloods believed that he possessed a charmed life and no bullet was ever moulded that could kill him. His personal acts of courage furnished full foundation for this belief and his name stands for the very definition of bravery among his people today. To students of the subject perhaps no Indian character appeals with such great force as that of Stand Watie. He was indeed a man of powerful personality and magnetism, with a courage and integrity as stalwart and changeless as the granite rocks of his native hills. He was ready as his life shows to make any sacrifice, compatible with honor for the good of his people. He did not thirst for pomp or glory but gave his great heart to duty as he saw it. Simplicity, sincerity and service symbolize his greatness. In addition, he introduces the reader to the interesting and often colorful leaders of the military North and South, including the only American Indian to attain a general's rank in the war, Gen. Stand Watie (member of the Cherokee Nation). With outstanding illustrations by Andy Thomas, this story is a tribute to those who fought and a revealing portrait of the important role they played in this era of our country's history. Meet The Author: A resident of Carthage, Missouri, Steve Cottrell is a descendant of a Sixth Kansas Cavalry member who served in the Indian Territory during the Civil War. A graduate of Missouri Southern State College in Joplin, Cottrell has participated in several battle reenactments including the Academy Award winning motion picture, "Glory". Active in Civil War battlefield preservation and historical monument projects and contributor of a number of Civil War relics to regional museums, Cottrell recently co-authored Civil War in the Ozarks, also by Pelican. It is now in its second printing.